Use the information from Exercise 7.7; first determine the final core - level FTEs for the ICU and CCU departments, where RNs and LPNs work on a 4/40 and NAs on a 5/40 scheduling plan; then re - evaluate the final core - level staffing requirements if all staff work on either a 5/40 or a (2 × 8 + 2 × 12)/40 scheduling plan, and make recommendations. For Famous Health care System (FHS), consultants from O & A determined the average daily patient demand for various nursing professionals. 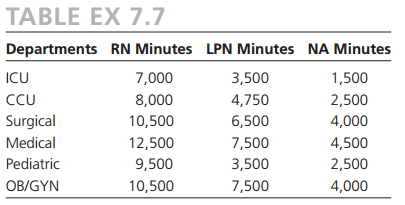 Table EX 7.7depicts the average number of minutes for Registered Nurses (RNs), Licensed Practical Nurses (LPNs), and Nursing Aides (NAs) needed daily in various patient care departments of FHS. a. Determine the core level of FTEs for each department. b. Determine the final core levels of FTEs for the Surgical, Medical, Pediatric, and OB/ GYN departments if all staff are scheduled for eight - hour shifts using a 5/40 scheduling plan. c. Determine the final core levels of FTEs for the ICU and CCU departments if RNs and LPNs work on a 4/40 and NAs work on a 5/40 scheduling plan. Explain why your example would qualify as a quasi-experimental design and describe the value of your design example to the research community.